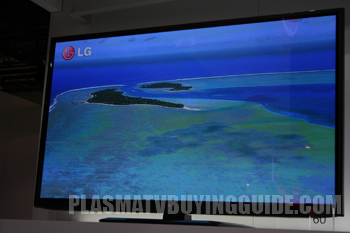 Even though the LG 60PN5700 sits lower in the lineup of LG plasma TVs for the year, it has more built-in functionality. The only real difference between the two series is the inclusion of LG Smart TV features and an extra HDMI port on the 5700 series. Everything else is practically the same. What does it cost for the extra features? The PN5700 sells for $100 more than the PN6500. That makes it an ideal selection for someone who doesn't already have access to streaming content (roku, game console, blu-ray player, etc. ) over a wifi network. It is important to note that the Magic Remote is not included with this TV. It has to be purchased separately. That helps keep the cost down, but those who want it will have to shell out some extra cash. The picture quality on LGs plasma TVs has improved significantly in the past couple years and the 60PN5700 series picture emanates a beautiful plasma image. The picture is dimmer when compared to the bright LED TVs on the market right now and slightly dimmer than plasmas from other manufacturers. It is even more important to have a light controlled room for this one. It may also not look great in the store because of this. But in a darker room at home colors and black levels come alive. Your living room is a lot different that a showroom floor and those LED are all on torch mode to make them look so much brighter. You would not use the TV in that way at home anyway. The 60PN5700 delivers some smooth contouring and though the upper limit of brightness is constrained it has a nice depth perception. Depth perception and a smooth clear image are a couple of the strengths of this TV. Color richness is average and not what you would get with a top Panasonic or Samsung plasma but is more realistic than most LED TVs. Black levels are average on this TV for a plasma and better than most LCD TVs. All that being said, the LG 60PN5700 does not have as good brightness, light flow through and color saturation as 1080p Samsung and Panasonic plasmas. Smart TV options are easily accessed by a button press on the remote. One problem we ran across consistently with streaming content was a lack of processing power from the PN5700 with movies or TV. (It has been much worse with 3D content on other TVs we've seen this year, so it is a relief that there is no 3D on this TV). The signal buffers and sputters more than acceptable. When we viewed some You Tube videos as a last test, the PN5700 buffered for a while when loading, then played it OK. But when we switched the resolution even to just 480p the buffering delay resumed. This is a big issue considering that Smart TV is one of the main reasons to go with the PN5700 over the PN6500. For a full feature review of LG's Smart TV platform with our ratings for the voice recognition and the Magic Remote see here. LG's TVs have had excellent sound quality this year. Their speakers aren't more powerful than some of the others, but they just sound better. Their isn't a muddled quality when it comes to mixing voices, background music, and sound FX. The PN5700 has the same look of the PN6500 above it. It is a mere 2.2” thick with thin bezels to match. The trapezoid shaped black plastic stand isn't at all flashy, but it looks nice. It's a no frills TV that focuses on the quality of the picture. As far as value goes, the LG 60PN5700 has some strong competition from Samsung and Panasonic. Smart TV and an extra HDMI port are the only reason this one goes for $100 more than the PN6500 seires. You have to decide if that makes it the TV for you. The Samsung PN60F5500 boasts a stronger feature set, but sells for around $300 more. The Panasonic TC-P60S60 is the competition from Panasonic, the price tag here is a good bit higher as well. In the end, it would be a good choice for a Smart TV enabled 60 inch plasma. © 2011 Plasma TV Buying Guide. All Rights Reserved.